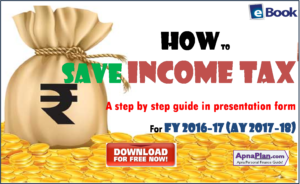 How to Save Income Tax for Fy 2016-17? We are releasing the eBook on Tax Planning for FY 2016-17. This is a short 45 slide power point presentation which gives the details of tax saving sections and investments available to individual tax payers. But first lets look at the changes in the Income Tax rules in Budget 2016. The New Tax Saving Guide for FY 2017-18 is now available for Download – Click here! 4. Tax Exemption u/s 80GG (for rent expenses who do have HRA component in salary) has been increased from Rs 24,000 to Rs 60,000 per annum. This is a good move to align the exemption amount with today’s rent and keep the section relevant. Budget 2015 has allowed additional exemption of Rs 50,000 for investment in NPS. We have done a complete analysis and concluded that it would be beneficial for you to discard this benefit and invest after tax money in a good equity mutual fund. The interest paid up to Rs 2 lakhs on home loan for self-occupied home is exempted u/s 24. There is no limit for home given on rent. Budget 2016 has provided additional exemption up to Rs 50,000 for payment of home loan interest for first time home buyers. To avail this benefit the value of home should not exceed Rs 50 lakhs and loan should not be more than Rs 35 lakhs. The total interest paid on education loan can be claimed as tax exemption. There is no upper limit for the same. Deduction Up to Rs 25,000 (50% of amount invested) is allowed if you make investment in preapproved stocks and mutual funds in Rajiv Gandhi Equity Savings Scheme (RGESS). This is available to first time equity investors subject to certain conditions. You can get tax deduction up to Rs 60,000 by paying medical insurance premium for self, your dependents and your parents. There is also sub limit of Rs 5,000 for preventive medical checkup. Deduction up to Rs 40,000 is allowed for Donation to certain charitable funds, charitable institutions, etc. Along with the tax saving options, it also has details about all the common salary components and their tax treatment. This section can help you to plan your salary components in case your company offers such facility. We hope that this eBook would help you in understanding, planning and saving taxes. Invested in Unitech few years bacl-(fixed deposits) Not a single Re received either as interest or return of capital. The Cos is broke and there is no news of any returns being made. Can this amount be set against tax? If so how much? Hi Amit, I have form16 and form16a (3 months), what is the right way to file returns? I did not get the question correctly. Please rephrase. You need both Form 16 (issued by employer for salary TDS) and Form 16A (issued by others for TDS) to file your tax return. Add income from both, take relevant deductions and TDS and file the ITR. Medical insurance premium is eligible for tax exemption. The Rs 15,000 is tax exempted medical allowance in case you submit relevant bills. Both are no way related. Also you can read about best tax saving options here. Is there Infra structure bonds for the fy 2016 2017 ? CAN IT BE BOUGHT AND INCORPORATED IN THE RETURNS AND GET REFUND? please guide. No Infrastructure bonds are NO more eligible for Tax benefit. So buying it from exchange would not help!